This is the first in the new series, and I think it holds a lot of promise for future installments. There is a fair degree of world building for both Turquoise and the rodeo setting. I enjoyed the set up and the plot, and I did guess the perpetrator, but it played out really well. I did like the second chance romance, and the lack of angst between TJ and his ex-wife, and Wacey. It was a refreshing change, in fact, it was dealt with humour. I also laughed when one of the boys told Wacey that there was a jar of pasta sauce! The little details were lovely additions to the overall story, rather than a distraction. Sometimes the flow was a little off. I think it was difficult to keep the timeline clear when showing the story from two very different viewpoints. I found some of the ancillary characters did not add much or could have done so without so much fanfare – Peter in particular. Overall, I enjoyed the story and would be happy to find myself reading more about the people of Turquoise. Texan to the bone and an unrepentant Daddy's Girl, BA spends her days with her basset hounds, getting tattooed, texting her sisters, and eating Mexican food. When she's not doing that, she's writing. She spends her days off watching rodeo, knitting and surfing Pinterest in the name of research. BA's personal saviors include her wife, Julia, her best friend, Sean, and coffee. Lots of good coffee. 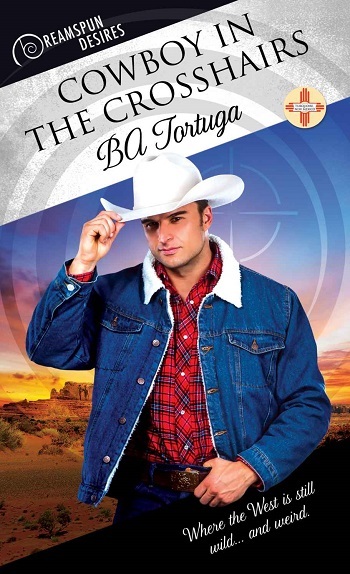 Reviewers on the Wicked Reads Review Team were provided a free copy of Cowboy in the Crosshairs (Turquoise, New Mexico #1) by B.A. Tortuga to read and review.